An over-sized and light-weight metal version of a classic trick! The Hot Rod is a well known classic of magic, and it's been around long enough that there are a lot of different versions of it available on the market. This particular one is a premium one made out of metal, in a larger-than-normal size, to ensure durability, visibility, and a quality and professional look. Many consider the Hot Rod trick well suited for "advanced beginners", which means that newcomers to magic can certainly learn it, if they are willing to learn and perfect the paddle move that is at the heart of this trick. This product comes in a sealed plastic bag, which includes a high quality metal hot rod, which is made out of polished light-weight yet solid aluminium. It has six brightly painted recessed circles, featuring white, yellow, blue, red, green, and black; with six red circles on the reverse. A cardboard insert gives instructions about how the effect works, with the majority of the explanation describing how to do the paddle move. The printed instructions also include a link to a secret page on the publisher's website that gives you free access to an online teaching video. 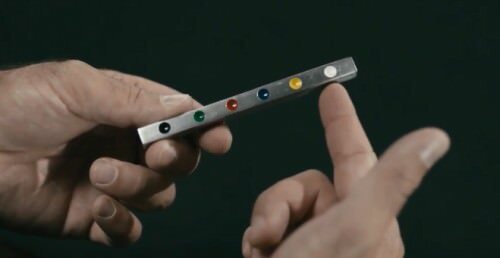 First you show your spectator that your metal Hot Rod has has six colored dots on each side. Your spectator then freely selects a number from one to six, and you use this to count to a particular dot, asking them to remember its colour. Then with a simple wave, all the dots on the Hot Rod magically turn into that colour - on both sides! The original colours can be restored, although alternate ways of ending the trick are also possible. Here's an alternative video trailer, which has ridiculously high production values, and features Rob Stiff demonstrating the effect. While you can certainly learn this trick from the printed materials provided, the paddle move really is best learned visually, so I really appreciated the fact that besides the step-by-step written instructions you also get access to online video teaching. A couple of different camera angles are used, with an over-the-head shot used for most of the video, which ensures that everything can be followed very clearly. The explanation video is eight minutes long and has Rob explaining the two main elements of the routine, namely the force and the paddle move, including tips for how to master the paddle move, and different ways to approach it. He also offers several suggestions for different ways to end the routine, including a method where you can allow spectators to examine it. This trick really isn't very difficult to do, and so there's good reason it has remained a popular favourite in the magic industry. In terms of the skills required to do it, there is a simple force that is used, and you'll need to be very familiar with the six outcomes so that you can produce the result you need easily and naturally. The most important thing to be mastered, however, is the paddle move, and while it's not difficult, it shouldn't be rushed into performance either. But this trick is certainly an excellent introduction to this concept, and for most people this move will be relatively easy to learn. From that point it's just a matter of being totally comfortable with both the force and the paddle move, so that you can focus on making the presentation interesting. Don't let the simplicity of this trick deceive you into underestimating its impact. Especially when seen close-up for the first time, it can really generate astonishment. And because it's not inherently difficult, it's ideal for beginner magicians, while still remaining an evergreen classic that the experienced magician can still use as well. The video instructions do a good job of explaining everything, and also emphasize the importance of mastering the paddle move before performing. 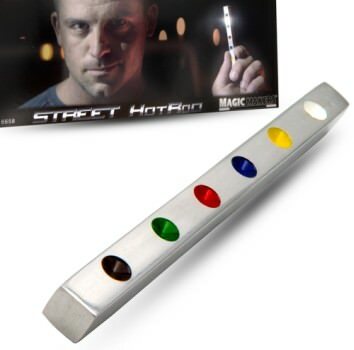 The larger-than-normal size of the Hot Rod is nice, because it ensures that the colours can easily be seen, and it is an attractive and quality metal product that conveys professionalism. Good presentation, plus mastering the technical aspect of the performance, are essential as always. But when done well, this simple trick really does have the potential to amaze. With the Street Hot Rod, you'll get everything you need to get you on your way to achieving that! Better to size up the spec and give each color an attribute (e.g. love, anger, honesty, sexiness, confusion, intelligence) with the required color given the attribute they would most likely choose. The best routine for Hot Rod, that I have come across, is Leslie Melville's from his book, Magictales 2. He combines it with another, similar trick, making a strong, entertaining, baffling presentation, and there's no force anywhere. Jack Shalom wrote: Paddle force...ugh. Yeah, my thoughts exactly. At least those were my thoughts a year ago, but after being schooled by a couple of magician friends, I have developed a new appreciation for some of those old chestnuts, including paddle tricks. Hot Rod plays amazingly well for general laypeople, and as an amateur who performs strictly for the fun, amusement, and amazement of general laypeople, that means a lot. I have also returned to the silly foil-embossed cards for Color Monte after decades of performing it with regular cards. Again, for general laypeople it plays amazingly well. For pros or semi-pros, and perhaps those who aspire to be such, perhaps these sorts of tricks won't resonate. For lifelong amateurs and lovers of fun, I would suggest getting back in touch with some of the older "slum" magic tricks. You might be surprised. I was. It's still a mystery to me why these simple tricks work and sell as they do. I'm curious how others end this routine - what do you think of the idea of 'painting' just one side red after showing both sides restored as coloured, and then handing it out for examination? Enders Game: I appreciate your reviews posted here, but please use some common sense when reviewing something as simple and well known as "Hot Rod" for a group of magicians. Your review could have been, at most, two short paragraphs and we would have known all there was to know. EndersGame wrote: what do you think of the idea of 'painting' just one side red after showing both sides restored as coloured, and then handing it out for examination? A terrible idea, probably thought up by a dealer so the ad copy could say that the rod could be "handed out for examination". I'm not sure any company has ever done more to rip off creators than Magic Makers have. But as noted above, do we really need a review of a Hot Rod in this forum? ... I mean really ... a Hot Rod? "Want me to write a review of your playing cards or magic? Contact me via Private Message." The end result of this is a bunch of free advertising for Magic Makers, and a bunch of free products for the reviewer. It's a joke really. And it's most definitely not a review ... it's really just spam. Richard Kaufman wrote: Enders Game: I appreciate your reviews posted here, but please use some common sense when reviewing something as simple and well known as "Hot Rod" for a group of magicians. Your review could have been, at most, two short paragraphs and we would have known all there was to know. That's a fair point, Mr Kaufman, especially given the readership here. I'll take that on board for the future. I really enjoyed reading through this older thread from 2002 on the Genii Forum, where there is some terrific discussion about the history and origins of the Hot Rod. Undoubtedly we are all familiar with the Hot Rod concept, but how many of us know who actually came up with it, and when? It appears to have been in the very early 1970s, and I've seen some attribute it to Jack Miller, while others attribute it to Jim Zee. Ken Allen's "Jumping Gems" from the 1950s is arguably a related ancestor. As for presentation, Robert Kane has shared a nice approach (here) he uses that was inspired by a Michael Skinner presentation as published in Genii in November 2000. Skinner's routine, "Liberace's Piano Keys", introduces the rods as piano keys given by Liberace. Robert runs with the idea of the hot rod being an ancient jewellers stick. A similar idea (here) from Steve Dusheck uses a plot revolving around lucky zodiac gems. He suggests a wonderful idea (here) of personalizing the trick by using a spectators zodiac sign, and he also came up with a zodiac force that could be used instead of the somewhat awkward spelling force. Peter Marucci also suggested an alternative force in his routine "The Gypsy Rod" (published in Linking Ring, February 2003), but this only employs five instead of all six colours. Evidently there are mixed feelings about the One-to-Six/Spelling Force. Who invented it? One source (here) suggests that Alan Smithee claims ownership of this idea. What a riot of a thread. The Skinner reference was a nice touch. EndersGame wrote: Evidently there are mixed feelings about the One-to-Six/Spelling Force. Who invented it? One source (here) suggests that Alan Smithee claims ownership of this idea. "Alan Smithee" is a made-up name that film directors use when they want to disown a movie that would otherwise carry their name (perhaps because the studio recut it into something horrible). Does anyone know a source for having custom Hot Rods made? Roger M. wrote: I'm not sure any company has ever done more to rip off creators than Magic Makers have. Agreed and agreed. Especially with these "Reviews" being larded with ad text and other bits and pieces that add exactly... nothing. These "reviews" are bloated to the point that I can honestly say that I've never had the patience to get completely through even one of them. Spam's a pretty good descriptor here. Once owned a set made by Peter Marucci that was very unique with velvet bags included. I know there isn't really an answer to this question, but . . .
What is it that makes this a "street" hot rod? How would it be different if it weren't "street"? Bill Mullins wrote: What is it that makes this a "street" hot rod? How would it be different if it weren't "street"? It think it's just to distinguish it from a standard hot rod. This one is much bigger than normal, since it's more than 8 inches long. Perhaps the idea is that it's more suitable for performing street magic to a larger group of people, and they can still all see what is going on? But the term "Giant Hot Rod" would have worked just as well. Since my previous posts, I've bought Hot Rod made by Rich Hill, pricey but fits brilliantly with the Leslie Melville routine I mentioned above, and there's no silly force in sight. EndersGame wrote: But the term "Giant Hot Rod" would have worked just as well. Only as a descriptive term. It would not be as successful as a marketing term, if you are targeting people who are inclined buy things because they are labeled "street". I would have thought that such a group would be so small as to not justify branding products with it in mind. Yet . . . This thing is eight inches long! Where are you supposed to carry it? Matthew Field wrote: This thing is eight inches long! Where are you supposed to carry it? I would also seriously question just how "deceptive" the paddle move is with what is essentially something getting close to the size of an actual paddle! Along with your Street Cups and Balls, Street Linking Rings, and Street Playing Cards, in your over-sized Street Knapsack. Oh dear, so many jokes, too new to the group to offend anyone...... Yet. Personally, I strap mine on. I get raves on my paddle move. Jack ... I didn't know you were that kind of guy! Finally, my wife is excited by my magic! I worked for 5 or 6 years for a large New York City home furnishing department store as their advertising director. Some of my co-workers knew of my interest in magic and wold ask me to "show them something." I'm basically a card guy, so I carried several "pocket tricks" with me, one of which was Hot Rod. How to justify the prop? I called it a jeweller's color sample, showing acceptable colors for diamonds, rubies, emeralds and other gems. I was never challenged. To force a color, I wrote down the colors on small pieces of paper and used the PATEO force. I disliked the standard Hot Rod force so much I once asked Pat Page if he could suggest an alternative. He did, but, honestly, I didn't like it at all. Neither did he. My points are two: I carried the thing in my pocket, and I had a justification for the gems mounted in a stick. The new version fails in both regards. There is a type of joke/puzzle partially well known in spanish culture; I don't if there is the same thing in english culture. Basically, you ask a person in a more or less rapid pace: "What's the color of the snow? What's the color of clouds? What's the color of cotton? What does a cow drink?". Now if you do it correctly, they will say "Milk" however this is clearly a mistake since cows drink water, not milk (grown up cows of course). So it works like a "hack" in your brain, by making you answer "white" a few times and then playing with the assocition implicit between cow and milk. Now in a similar vein, if you ask someone "How much is 5x5?" and then ask "Name a color" they will say "red". Try it and see. So you can say "We will eliminate 5 colors, how much would be 5x5?" and then ask for a color it will probably work (although there is no reason for the 5x5). Oddly enough I haven't the slightest idea what a hot rod or a colour monte trick is even though I have been doing magic for about 60 years or so. I will concede that I have heard about those tricks but I have no idea what they are supposed to do. So the reviews are welcome to me. Never make assumptions about what people know or don't know. Besides I suspect those particular tricks were invented after 1954 so that is probably why I don't know them. I also didn't know what it was, although I certainly heard the name many times. I just never cared to know. I do two paddle tricks and that is quite enough for me. I do the Dotty Spots trick (which I suspect comes from Edward Victor although I can't be sure) and the Dr Sack Dice trick which has always stood me in good stead. I have carried them around with me virtually every day of my life since I was 16 years old. At least they fit in my pocket. That Hot Rod thing looks a bit too big for impromptu use.